SNAFU! : Glenna June Bellomy Anderson (1926 - 2008). via SixPence Tumblr Page. Glenna June Bellomy Anderson (1926 - 2008). via SixPence Tumblr Page. Glenna June Bellomy Anderson (1926 - 2008). 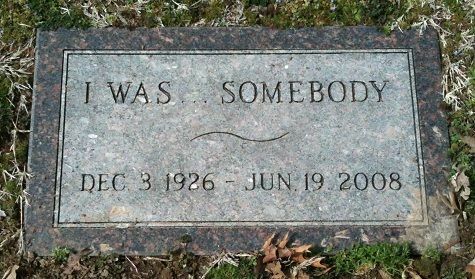 When the cemetery sexton sold Glenna her stone, her request for the inscription on it was “I was… somebody.” He said the reason was that Glenna felt that many years after she died no one would probably remember her anyway. By having this inscription on her stone, people would see & remember it. Park Cemetery, Carthage, Missouri. Psalm 144:4 They are like a breath; their days are like a fleeting shadow....I'm not religious but it does seem that the good book got this one right and in spades.